South Padre Island and Port Isabel have so many good places to eat -- and who worrys about calories on vacation, anyway? If you get the chance, please mention you saw them on SPIonline.com - thanks! 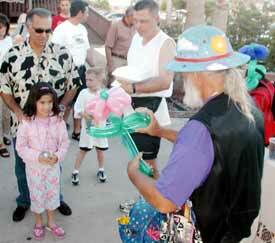 You will know it is summer when the Balloon Guy returns to Blackbeards! Inside and out - Fine Dining Downstairs on the Bay. A great place to get out of the sun or dine in the air conditioned covered patios. "Sun your buns, then come eat ours! Bar, Grill and Water sports paradise! The sun sets at Scampi's! Fine dining, live music and an intriguing wine list -- with one of the best views on South Padre Island.